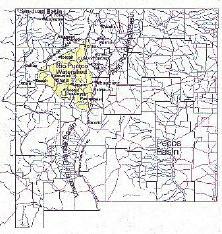 The Rio Puerco basin of New Mexico lies due West of Albuquerque. The Rio Puerco is a tributary of the Rio Grande; at the confluence the Rio Puerco contributes about 4% of the annual water flow and about 78% of the sediment. Why is the Rio Puerco a particularly high generator of sediment? First, it is in the range of annual precipitation that produces maximum sediment (see sediment yield curve and erosion vulnerability map). Second, a large fraction of the Rio Puerco Basin is composed of shales and siltstones that erode readily, creating areas of high sediment yield that contribute to a large store of fine-grained, easily-eroded, valley-fill materials. Third, the Rio Puerco basin has substantial topographic relief; high terrain helps to generate precipitation and steep slopes provide sediment-moving power to the resulting runoff. Fourth, the Rio Puerco basin is prone to large thunderstorms during the summer monsoon season; annual precipitation is concentrated in a few events that are capable of moving large quantities of sediment. The geologic and topographic factors that predispose the Rio Puerco to high erosion have existed for many thousands of years. 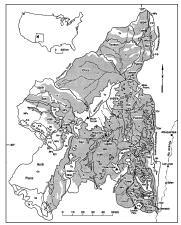 Variations in sediment production and periodic occurrence of basin-wide episodes of arroyo incision have puzzled scientists since the Rio Puerco was first studied in the 1920's. Scientists have speculated on the relative importance of varying climate, grazing, and cycles of sediment movement self-induced by the basin and its channels. Current research is aimed at improving quantitative knowledge of these factors. What problems are caused by Rio Puerco's sediment? These fall into two categories: local effects and downstream effects.